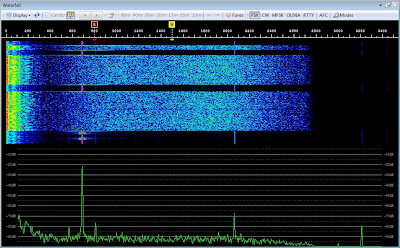 While operating PSK on 20m this morning I received a report that I was splattering across the band. With this in mind I though I should look into this. I was not operating outside my normal situation. Not knowing how bad the problem was, I went up to 18.1MHz to find a quiet place to poke around. The only station I saw on the band was a fellow operator here in Ottawa, VE3OIJ. We transmitted back and forth a bit and found nothing remarkable. Leading me to think nothing is seriously broken. Spurs @ 3300Hz @ -80dB ?? 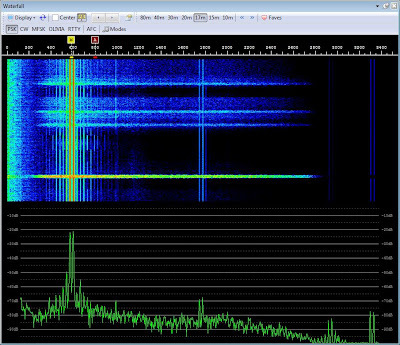 At 6dB/S-unit, if my fundamental was received at his station at S9, then this "splatter" would be received at -S2, i.e. 2 S-units below, S0, these cannot possibly be the splatter my fellow operator saw. 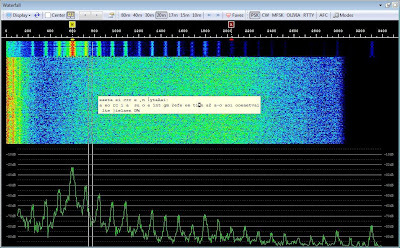 VE3OIJ was able to see these terms, but we are less than 10km apart. It may make sense to follow these terms a bit more. 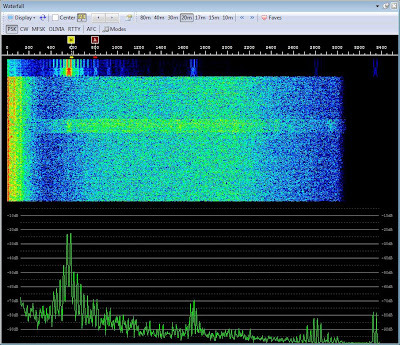 The plot below shows my signal from 1W to 150W into my dummy load. In all cases the relative size of the "splatter" remained fixed. This tells me that these terms are not being generated by the radio's linearity ans regardless of my transmit power would not be a problem to any one but an operator in my city. How to get gid of these? Don't know. Next step was to try back on frequency, in case it was RF feedback into the shack that only happens on 20m. 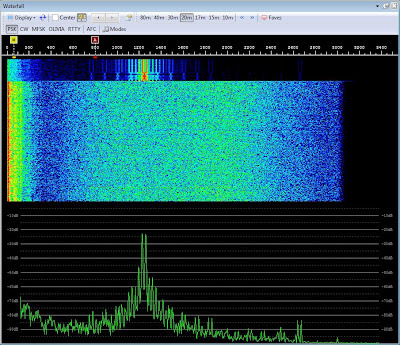 Below is a typical waterfall on 20m, "strong" signals are 30dB above the noise floor. If anyone else had terms like the ones above in their transmit signals there is no way I would ever see or be concerned with them. I cannot improve the relative power in these terms by adjusting my TX power, as they go dB for dB with my fundamental signal. Only someone in my local area will see these signals as significant, and the operator who indicated I was splattering did not leave his call so I can not tell. I should has asked, but I did not, a short QSO may have been a better idea. For now I'll assume every thing is ok and go back to having fun. 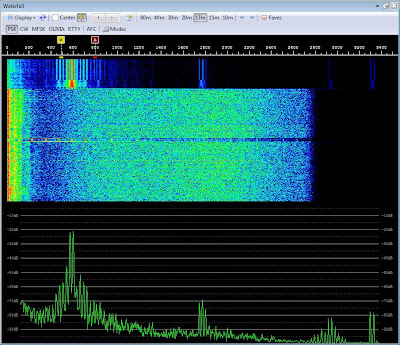 Here is another plot of my tx signal. I was in a QSO with a Spanish station and received a 575 report, so again I thought something must be wrong. 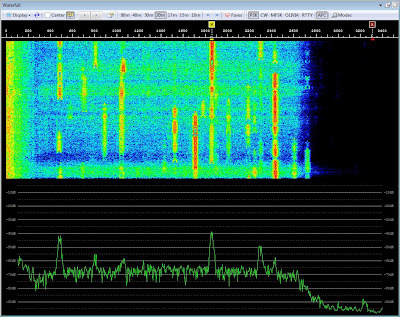 A plot of my transmit signal is below. This time I recognized that the "regrowth" was at N times 120Hz, pointing me to a power problem. Also, I though I'd take a look at my CW output as a means to remove the PSK hardware and software from the equation. Below is my CW plot, this was for 10W output. I can see in the plot above, that the same N*120Hz side tones are present, the first pair are only 35dB down. I can see in the plot below, that only the first 120Hz side tones are present, but now are 60dB down, a 25dB improvement. The MFJ-1164B power bar will need some further investigation. 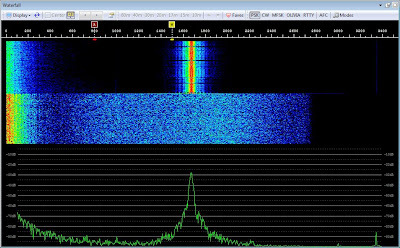 In the meantime, returning to PSK mode, below shows a much improved transmit signal. 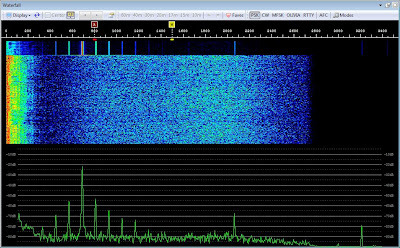 Now I think I have a very good idea of how clean the PSK signal should be from my radio and will keep an eye. 1) If you have an extra radio and Signallink you can run 2 copies of DM780 and see your own transmit signal. Grounding the second rig's antenna input will enable enough signal in to be detected. 5) a good transmit signal will have better than 25dB IMD, better than 25dB SNR and 60 to 70dB spurious free range.